Another example of cost being removed from the program. Good to see things like 3D printing are having an impact here. Lockheed Martin has announced a price reduction for the F-35’s Full Mission Simulator (FMS) by US$3 million per unit, enabling F-35 pilots to get combat and mission ready quicker and cheaper, as production costs drop for both the airframe and support infrastructure. To date, more than 700 pilots have completed training in the FMS. Comprised of 15 simulators, the low rate initial production (LRIP) 11 generates about $45 million savings for the F-35 program. Leveraging advanced manufacturing techniques, highlighted by the integration of 3D printed simulator parts including component housings and brackets. Amy Gowder, TLS vice president and general manager, said, "We're serious about driving out costs and excited to generate continued production savings across all our programs using advanced manufacturing." F-35C: The aircraft carrier variant designed to take-off from US Navy aircraft carriers and land using trap mechanisms on the deck of the vessels. The FMS provides an affordable training option for F-35 pilots and commanders, with pilots completing roughly half of their initial qualification flights in the FMS, while after graduation, pilots remain in a continuous learning environment with access to training courseware as part of the FMS suite in order to maintain and enhance skill proficiency and combat readiness. "In addition to our production savings, we're investing more than $30 million through 2020 to reduce F-35 training sustainment costs while increasing concurrency and capability," Gowder said. Driving continuous concurrency between the training system and the F-35 aircraft. The F-35 Training System supports continuation, upgrade and mission rehearsal training for qualified F-35 pilots. While the high-fidelity of the F-35 FMS allows pilots to split their training regimes 50/50, with 50 per cent of their training hours logged in the actual aircraft and 50 per cent of their training hours logged in the FMS. F-35 training milestones for 2019 include the initial distributed mission training (DMT) capability and Block 4 training system upgrades. DMT allows physically separated aviators to train together and enables interoperability with fourth-generation platforms in a virtual environment. Mission Rehearsal Trainer (MRT): A small footprint trainer that shares common hardware and software systems with the FMS, but incorporates a limited visual display system. On track for 91 deliveries this year. Presenting at the Credit Suisse Industrials Conference, CEO Marillyn Hewson said Lockheed Martin (LMT +0.2%) is on track to deliver 91 F-35 jets in 2018 and has delivered more than 330 of the fighters to date. While the F-35 program represents the company's largest growth prospect, Hewson also sees an opportunity in the F-16 program. She further noted that current backlog ensures 2020 sales growth regardless of the U.S. defense budget and said Lockheed has a strong offering for the Army's Future Attack Reconnaissance Aircraft contract. An 87.5% availability for the recent deployment to Europe is impressive and should only increase as more Blk 3F jets enter the fleet and maintenance practises, and especially spares availability, increases. Valid claims by Lord and Winter on reducing sustainment costs and doing this is obviously in LM's benefit as it increases to export potential for the aircraft. The top Pentagon buyer said today the operating cost for the F-35 has to come down at the same time that mission capable rates must ramp up by double-digits. And it needs to happen in less than a year. “Cost per flight hour needs to come down to fourth-generation [aircraft] levels and the availability needs to come up to 80 percent,” Ellen Lord told the Association of Old Crows electronic warfare conference this morning. It was the latest in a long line of calls from Lord and other Pentagon officials to slash F-35 operating costs while the Air Force and Navy continue to spend tens of billions to buy more aircraft. The latest available data has the F-35 hanging around at about 55 percent availability, making Defense Secretary Jim Mattis’ Pentagon-wide call for most fighters to hit the 80 percent mark by next September a tall order. But Lord said she can get it done. In September, Mattis signed an order demanding that availability rates for the Air Force and Navy’s F-35, F-22, F-16 and F-18 inventories reach 80 percent in an attempt to blunt the slow slide in readiness seen in recent years. The F-35s per flight hour operating costs have already fallen and are edging closer to those of of F-16, according to Air Force officials. At the Farnborough Air Show in July, Lockheed Martin executives said they believe they can reduce operation and maintenance costs by 38 percent over the next decade. Lord said that will require upgrades to older, 4th generation aircraft so they can share data and keep up with the F-35. In addition to sharing the F-35s much better situational awareness, it also means the 4th gen planes can use the F-35s much better targeting data. Lord also disclosed that Mattis has signed an order outlining how the Pentagon generates and consumes data, but the details are classified. Is the Pentagon report to US Congress on Turkey's F-35 bid misleading? In a report to the US Congress, the Pentagon says it will reassess Turkey’s participation in the F-35 Joint Strike Fighter (JSF) Program, citing Ankara's recent agreement with Moscow to procure S-400 missile system. Turkey has invested more than $1.25 billion in the F-35 program since 2002 and it should have received 100 F-35 fighter planes this year. But the Trump administration postponed the crucial delivery for the second time in August. The JSF program is the world’s most expensive arms project to date and Turkey is a key producer of the F-35 manufacturing parts for all variants and customers. “The Administration will reassess Turkey’s continued participation as one of eight partner nations should they continue with their purchase of the S-400,” said the Pentagon report. TRT World has a copy of the report. The report's 'executive summary' says that US may impose sanctions on Turkey if the S-400 deal moves ahead. “The US Government has made clear to the Turkish Government that purchasing the S-400 would have unavoidable negative consequences for US-Turkey bilateral relations, as well as Turkey’s role in NATO,” the summary said. Despite offering a repeated criticism of Turkish purchase of the S-400s, the report has still maintained that Ankara has legitimate concerns, seeking a missile system in the face of “growing regional security threats” coming from its politically unstable southern neighbours. The report has also acknowledged Turkey’s frustration “with its protracted, decade-long search for an air and missile defense system.” It eventually led the country to buy “the S-400 surface-to-air missile system from Russia in July 2017,” the report conceded. There are “no significant risks” for fighter jets’ being part of Turkish military inventory, one of the sources said. “Higher-ups have figured out the issues surrounding the deal,” an official in the ministry said. Located between Europe and the Middle East, Turkey has long searched for a powerful anti-aircraft system to defend its geopolitically sensitive borders against various threats stemming from its western and eastern flanks. On the western front, Turkey has disagreements with Greece over the delimitation of the Aegean continental shelf and other border issues has often caused tensions between the two countries. On the southeastern flank, where ongoing civil war in Syria and instability in Iraq following the US invasion, Turkey has been dealing with several security threats, mostly coming from the PKK, which is considered to be a terror group by the US, EU and Turkey. The PKK and its affiliates are also present in northern parts of Syria and Iraq. For Turkey, it was significant to purchase Russian S-400s since the US did not provide the Patriot missile system to Turkey on agreeable terms, despite Ankara's repeated requests. The initial delivery of S-400 missile defense system is expected in July 2019. “The current deal is a done deal. I cannot cancel it,” Turkish Foreign Minister Mevlut Cavusoglu said, referring to the S-400 purchase. However, he still indicated that Turkey was still keen on making more defense purchases from its NATO allies. Beyond Turkey’s disagreement with US on S-400s, Ankara has other political issues with Washington, primarily in northern Syria. Despite Turkey’s strong opposition, US continues to support the YPG, which is a Syrian wing of the PKK. Turkey has produced compelling evidence to prove the two organisations worked together but Washington has been denying any possible linkage. The Italian Air Force has declared IOC for the F-35. Congratulazioni! The @ItalianAirForce's F-35As are operations ready! With the declaration of Initial Operating Capability, Italy becomes the first European nation and international partner to declare IOC and certify readiness for allied operations. Puff piece about the F-35s arriving in Australia shortly. Back in 1985, the Royal Australian Air Force’s newest fighter planes, the F18s, were leaving Lemoore military airbase in California on their delivery flight to Australia. My report from the scene spoke of the long record-breaking flight ahead to Williamtown, near Newcastle, and the excitement in Australia that a new generation plane was about to arrive. Fast forward 33 years to now, and I find myself at Luke Air Force Base near Phoenix, Arizona. Here at Luke there’s the same excitement as there was at Lemoore all those years ago. A new generation of RAAF crews making final preparations for the F18’s replacement, the F35A, to fly – yes, again – to Williamtown. The F35s have been a while coming and not without plenty of controversy. Now this week the first two RAAF F35s are headed for their new home in Australia. Australia is eventually getting 72 F35s over the next five years and at $125 million each, Australia gets what is considered the most lethal warplane ever built. It is almost undetectable by radar. It flies at one-and-a-half times the speed of sound. A lethal killing machine. Wing Commander Darren Clare is one of the two Aussie pilots taking these first single seater F35s to their new home base. "It's absolutely a flying computer. A computer pretending to be an airplane," Clare said. Over the years since 2002 various Australian government ministers fended off criticism that the joint strike fighter purchase was an expensive mistake. The pain continued for years. It was way behind schedule and billions of dollars over budget. Slowly, Lockheed Martin sorted out the bugs and the F35 is set to become the workhorse of more than a dozen air forces around the world. The government’s purchase agreement included 15 Australian companies being contributors to the project. Sections of the vertical tails of the aircraft are manufactured in Victoria, South Australia and New South Wales, the weapon adaptors in Queensland and engine parts are made in Western Australia. "There are Australian components in every F35,” Billie Flynn, the F35s legendary test pilot, said. “So, it’s not just the 330 aircraft that have been built to date. It is 3000 or more aircraft that we will build over its lifetime. “That is an astonishing investment in Australian industry now and into the future." The F35 in Australia is expected to create hundreds of more jobs. We were given a tour of the Lockheed Martin production line in Fort Worth, Texas and up close, no matter where you look on the completed F35s you won't see the guns, the cameras or the antennas. They are all there but embedded inside what is a very deadly aircraft – and the ultimate stealth fighter. "With the F18s the bombs, the missiles and the long-range fuel tanks sit on the outside of the plane,” said Mr Flynn. “But with the F35, all that is internal and as far as radar is concerned it means the pilot and his plane are almost invisible. “He or she flies with absolute impunity knowing that the enemy will be unable to detect him." Mr Flynn makes an important point: as far as the aircraft designers are concerned there is one thing that matters above all else. "It takes three years to build a fighter jet. It takes 26 years to build a fighter pilot,” he said. “What we care about, as parents, is that we are going to send our sons and daughters into harm’s way and what matters to us is that those men and women flying those fighter planes are coming home every single day." The two F35s will spend several days making a relatively slow trip to Australia touching down in Hawaii and Guam as well as air to air refueling. They will land in Brisbane on December 10 before moving on to the F35 home base in Williamtown. Some work awarded to LM as the USN prepares to declare IOC early next year. The U.S. Navy is awarding Lockheed Martin $18.5 million for program-related and logistical work on the F-35 Lightning II Joint Strike Fighter. The modification of a previously awarded contract calls for analysis of the F-35's ability to accomplish its mission regarding participant requirements, such as the U.S. military and other nations either directly involved in the program or as outside buyers. The analysis will include studying cost and weight reductions and simulations of the aircraft's performance. The contract is expected to run through December 2019 with funds to be obligated upon each contract order. The F-35 Lightning II Joint Strike Fighter is a 5th generation multi-role stealth fighter aircraft slated to replace most of the U.S. fighter fleet and supplement other nations participating in the program. Over 320 aircraft have been delivered to the U.S. and partner nations, and planned buys are expected to boost that number by hundreds over the next several years. Long-term production plans call for nearly 3,000 planes to be built for the U.S. military and approved foreign buyers. F-35A Air Force and Marine Corps vertical takeoff and landing B models have already reached initial operational capability with several U.S. squadrons deployed with the USS Wasp and USS Essex amphibious assault carriers, in Japan and the Middle East. Although lingering, unresolved software issues have left the planes without their full capabilities, the Department of Defense has said deployed planes are ready for combat. The Navy F-35C designed for large Nimitz-class and Ford-class fleet carriers is expected to become fully operational sometime next year, according to the F-35 Joint Program Office. After several years without a functional aircraft carrier, Britain introduced the HMS Queen Elizabeth to the Royal Navy in December 2017 and the HMS Prince of Wales is expected in 2020; the UK is in the process of acquiring 48 US F-35B naval jets for their flight decks. However, the Royal Air Force is interested in growing its own fleet. Two sources close to the Royal Navy have said that senior Royal Air Force officers are privately pushing for the UK to purchase F-35A Lockheed Martin supersonic jets, which are incapable of taking off from aircraft carriers, rather than some of the 48 F-35 Lightning II jets it has ordered that can operate from ships at sea, Sky News reported. The sources said that any cut from the order for next generation F-35B aircraft, which will be able to take off and land on the HMS Queen Elizabeth and HMS Prince of Wales, would be a huge mistake, as it would redistribute the planes the £3bn carriers will be equipped to carry in the coming years. The source outlined that the Royal Navy officials are in fury over the wish of Royal Air Force to put “its self-serving agenda above what is best for the nation”, calling the whole situation “an absolute disgrace” which “should not be allowed to happen”. The UK Ministry of Defence told Sky News that its policy for the first 48 F-35 jets remained unchanged. More than a third of the warplanes have already been delivered, and the rest are expected to be delivered and operational by 2025. Overall the UK plans to purchase a total of 138 of the Lockheed Martin aircraft, without stating which variant, over the lifetime of the US-led programme, Sky News reported. Royal Air Force officials dismissed all claims, calling the rumours “ill-informed”. However, the sources told Sky News that a final decision on the last batch of 13 jets out of the first 48 does not formally have to be made until the end of next year, adding that the decision to switch to the land-variant F-35A warplanes would enrage the US, who had helped the UK rebuild its ability to launch such warships after the UK armed forces were forced to put carrier-operations on hold in 2010 to save money. “If the British turn up to an operational theatre without combat aircraft it will completely undermine their military capability. To the US this is a really big deal. If the RAF go for the A variant at the expense of the carriers, which is effectively what they are saying, this will be perceived by the US as a major betrayal,” the source said, cited by Sky News. Senior officers in the RAF are understood to be keen for a mix of carrier-capable and land-based F-35s among whatever number is ultimately purchased. They note that the A-model, which costs less than its £90 mln carrier-equipped twin, can fly further and carry more weapons. However, senior experts from the UK's Defence Analysis journal noted that under current circumstances the UK cannot afford two different F-35 fleets. The sources also outlined that RAF officers want to buy land-based F-35s among whatever number is ultimately purchased because they do not want to have their future tied to operating aircraft from the sea. While the three F-35 operating services will be happy with this appointment I think the USAF will be most happy. They have been keen to increase production and this will likely see Congress fund additional F-35s each year. The Pentagon’s F-35 fighter jet program may be set for a good 2019 on Capitol Hill. One of its top proponents, Rep. Kay Granger, R-Texas, has been picked by her party as the new ranking member on the House Appropriations Committee, which will hold the purse strings when it comes to future purchases of the pricey jets. The Republican Steering Committee elected her for the spot on Thursday as its most senior member and current chairman on Appropriations, Rep. Rodney Frelinghuysen, R-N.J., is set to retire. “The hard work to reform the committee begins today,” Granger said in a statement following the vote. Lockheed Martin has a mile-long assembly plant for the F-35 jets in Fort Worth that is in Granger’s district. Earlier this year the congresswoman, who is serving as the chairwoman of the Appropriations defense subcommittee, spearheaded $9.3 billion in funding to buy 93 of the aircraft. That was 16 more of the aircraft, which cost about $89 million apiece, than the military had requested this year. The program is the most expensive in Pentagon history and is the flagship profit center for Lockheed, one of the biggest U.S. defense contractors. Granger’s party was unable to hold the House majority in the midterm elections. But the ascent to the top Republican spot on the committee puts Granger in a powerful position to push more F-35 purchases as Congress begins a fight over whether to pump up the defense budget again in 2019 by tens of billions of dollars. Meanwhile, Democrats will take the House majority in January and Rep. Nita Lowey, D-N.Y., who has advocated for timely funding of the Pentagon, will ascend to Appropriations Committee chair. It will be the first time in history that the powerful committee has been led by two women, according to the Washington Post. The British acquisition plans have been baffling for years. Buy enough F-35B to run bot carriers fill up plus train. Give them to the navy. If the Air Force wants F-35a then have them scrap their Eurofighters for them. Given how limited the Uk defense budget is save money going to one type and move on. Eurofighters time has passed and that should be recognized. Sad that it happened only a few years after it entered service but such is life. An opinion piece on US Turkish relations with references to the F-35. Last summer just before American Pastor Andrew Brunson’s case turned into one of the greatest dramas in the history of Turkish-American relations, one other interrelated crisis was looming on the delivery of the first two F-35 fighter jets to Turkey. The Congress, which had stepped in to lock the delivery of the F-35s until Ankara releases Pastor Brunson and halts the purchase of Russian S-400s, managed to place the fate of the F-35s in a critical document like the National Defense Authorization Act (NDAA) 2019. However, the efforts of Secretary of Defense, James Mattis, yielded to a softer language in the final version of the defense policy bill. Mattis persuaded the senators to drop provisions that would prohibit transfers of F-35s to Turkey until the Pentagon develops a plan to remove Turkey from the program. He did so by arguing that throwing Turkey out of the F-35 Joint Strike Fighter (JSF) Program would cost a fortune to the United States and the administration had reasons to believe their diplomatic pressure campaign against Ankara might eventually work. This is indeed a key element that shapes the mindset of the U.S. national security officials. Despite high-level statements from Ankara that the agreement to purchase S-400s signed in 2017 with Moscow is a done deal and it is irreversible, the U.S. side has confidence that the Turkish government can still be persuaded to change its mind. Turkey’s last-minute withdrawal from a Chinese deal to purchase HQ-9 missiles in 2015, Americans believe, was the result of a successful diplomatic pressure campaign from Washington that lasted for two years. A classified report on the current state of relations with Ankara as required in the 2019 defense bill was submitted to the Congress a few weeks ago by Secretary Mattis. Amid criticism from senators for keeping the document ‘classified’, a two-page summary of the report was cleared for open publication on Nov. 26. There is nothing surprising in the report in the sense that underlines the conclusion of the acquisition of the S-400s by Ankara would risk the Turkish participation in the F-35 JSF program, jeopardize other potential future U.S. arms transfers to Turkey or invoke potential sanctions against Turkish defense sector. We heard exactly the same arguments time and again from the U.S. officials since the beginning of the year, so as the members of the Erdoğan government. Though, it is crucial that the report confirmed an alternative Patriot package has been developed by the Trump administration to strike a change of heart in Ankara. In fact, with this report Mattis once again asked help from lawmakers to pursue a great bargain with the Turks in the coming weeks. Because everybody in Washington knows that chances for Ankara to walk away from the S-400s deal with Russian President Putin is zero, unless there is some sort of a congressional guarantee for those Patriots. How the Trump administration would ensure a congressional guarantee for a new Patriot deal given the steam against President Erdoğan’s at the Hill for drifting the country away from democracy remains a mystery. Furthermore, the Pentagon report makes it clear that if Turkey goes ahead with the actual deployment of the S-400 batteries the programs that would be affected would not be limited to the F-35s and Patriots. Some other U.S. equipment like CH-47F Chinook heavy lift helicopters and UH-60 Black Hawk utility helicopters, some of which are currently in use by the Turkish armed forces, are too listed. More importantly F-16s are among the named. As far as I could gather from open sources Turkey purchased a sum of two hundred seventy F-16 planes since 1988. However, the current inventory of F-16s in Turkey is around two hundred forty. Turkey has lost nearly thirty of its F-16 fleet in accidents most of which were due to metal fatigue. Thus the modernization of Turkey’s F-16 fleet is of critical importance considering the central role Fighting Falcons play in Turkey’s military operations in Syria as well as against the outlawed PKK inside its own borders. Last week’s senate vote, which paved the way for legislation to withdraw American support for a Saudi-led coalition fighting in Yemen despite counter efforts from Trump’s cabinet, demonstrated that Capitol Hill can seriously force the President’s hand in key foreign policy issues. Though, Ankara still seems to be placing all their bets on Trump. Godspeed. Some Directed Energy Weapon info with the F-35 being a good candidate for the weapons. F135 related contract award for continued maintenance support. The Pentagon has awarded the United Technologies subsidiary Pratt & Whitney Military Engines a $399.8 million contract for the F-35's F135 engine for both domestic and foreign partners on the program. The contract modification applies to the Air Force, Navy, Marine Corps, domestic contractors, partner nations and Foreign Military Sales. The F-35 Lightning II Joint Strike Fighter is a fifth generation multi-role stealth platform expected to replace most of the U.S. military's fighter fleets and operate in support of other aircraft. Over 320 aircraft have been delivered to the U.S. and partner nations, with the planned buys expected to boost that number by hundreds over the next several years.. Long-term production plans call for several thousand planes to be built for the U.S. military and approved foreign buyers. The Air Force's F-35A and Marine Corps' vertical takeoff and landing F-35B have already reached initial operational capability, with several U.S. squadrons deployed on the USS Wasp and USS Essex amphibious assault carriers, Japan and the Middle East. The F-35 Joint Program Office has said the deployed F-35's are ready for combat. The Navy F-35C, designed for large Nimitz-class and Ford-class fleet carriers, is expected to become fully operational sometime next year, according to JPO. I’ve always felt that 138 F-35B was too many for the UK while numerous posters on here have indicated that the UK was unlikely, even if they actually ordered all 138, to operate them all at the same time. In that context I agree with the suggestions that the fleet could be split into two variants, especially as the acquisition and operating costs of the A model are significantly less than the Bee. Perhaps a 90/50 split would provide enough Bee models (90) for the carriers and enough spare airframes to train aircrew while 50 A models would be enough for three squadrons. Some more info from a senior USAF Officer on F-35 capabilities. The Air Force lauded the display as evidence of America’s overwhelming military might. At least one critic dismissed it as a publicity stunt. In fact, there’s one region where mass-takeoffs are an important military procedure: the Korean Peninsula. Ironically, that’s the one region where the Trump administration is deliberately limiting the flying branch’s authority to organize large-scale warplane-launches. The November group-takeoff, which the Air Force calls an “elephant walk,” involved F-35As from the 388th and 419th Fighter Wings at Hill Air Force Base. The active-duty 388th and reserve 419th train Air Force F-35 pilots. The 388th’s 34th Fighter Squadron, whose F-35s have the latest Block 3F software, also has a front-line role. In late 2017, it became the first Air Force F-35 unit to deploy overseas, to Japan. At the time of the elephant walk—the first for the F-35—the Utah wings possessed around forty F-35s. The wings are on track to receive a combined seventy-two F-35s by 2019. The Hill stealth fighters took off one at a time in roughly 30-second intervals. In just a few minutes, the wings launched as many F-35 sorties as they normally do in a full day of routine training. “Exercising with multiple squadrons of F-35s can demonstrate our ability to defeat potential adversaries wherever they may arise,” Maj. Caleb Guthmann, the 34th Fighter Squadron’s assistant director of operations, said in a statement . “Call me when they fix all the ALIS problems and then we’ll talk,” Insinna added, referring to the F-35’s buggy Autonomic Logistics Information System, a computer network for the type’s maintainers. In a March 2018 congressional hearing, Lt. Gen. Jerry Harris, the Air Force’s deputy chief of staff for plans, programs and requirements, said it cost around $50,000 to fly one F-35 for an hour. That’s roughly twice what an F-16 costs for an hour in the air. In fact, elephant walks significantly contribute to the readiness of American and allied squadrons in South Korea and nearby countries. In the event of war with North Korea, U.S. and allied forces plan to quickly target the roughly 13,000 artillery pieces that Pyongyang has massed along the Korean demilitarized zone. In the early hours of a war, that artillery likely would bombard Seoul, which lies just 25 miles south of the DMZ. “A serious, credible threat to 25 million [Republic of Korea] citizens and approximately 150,000 U.S. citizens living in the [Greater Seoul Metropolitan Area] is also posed from its long-range artillery,” U.S. Army general Vincent Brooks, head of U.S. Forces Korea, told a U.S. Senate committee in March 2018. The Air Force maintains three F-16 squadrons and an A-10 squadron in South Korea and two F-15 squadrons in Japan. Additional squadrons, almost certainly including F-35 units, would join them during a crisis. An air campaign targeting North Korea would require 2,000 sorties per day, U.S. military officials told Air Force magazine. By comparison, the allied air war over Iraq and Kuwait in January 1991 averaged 1,200 strike sorties per day, according to statistics compiled by David Deptula, a former Air Force general who is now an analyst for the Mitchell Institute for Aerospace Studies in Virginia. The U.S.-led campaign against Islamic State in Iraq and Syria averaged just fifteen strikes per day, according to Deptula. The roughly 100 U.S. F-16s and A-10s in South Korea and Japan—and any F-35s that deployed in time for the first day of fighting—likely would be the first to hit North Korean artillery. And they’d have to launch fast to save lives in Seoul. There is a reason that the 7th Air Force in South Korea and Japan has organized more elephant walks than most Air Force commands have done. “The threat here on the peninsula is very real, and countering that threat needs to be in the forefront of our minds,” Col. William D. Betts, then-commander of the 51st Fighter Wing in South Korea, said in 2017. But the Korea elephant walk is an endangered species. The 7th Air Force has conducted most of its mass-takeoffs, which require intensive planning and maintenance efforts, under the auspices of the annual Vigilante Ace exercise. In 2018 the Trump administration suspended Vigilant Ace as a concession to North Korea, hoping that Pyongyang in turn would suspend its nuclear-weapons program. North Korea has continued to develop its nukes. The Air Force organized elephant walks in South Korea in 2016 and 2017 but not in 2018. The suspension of large-scale exercises with South Korea hasn’t created “immediate” concerns about combat-readiness, Pacific Air Forces commander Gen. Charles Brown said in November 2018. But it could cause “difficulties” if it continues. There’s nothing preventing Air Force squadrons that aren’t in South Korea, including Hill’s F-35 units, from practicing mass takeoffs. These same squadrons might deploy to the Korean Peninsula during wartime, in which case their elephant walks would amount to more than an expensive public relations exercise. They’d be prepared for the kind of sudden, overwhelming violence a new Korean war would require . Some info on what the impact to the F-35 program would be if Turkey was politically removed from the partnership. A potential decision by the United States to remove Turkey from the F-35 program over its purchase of the Russian S-400 missile system may have only minimal impact on the fighter jet’s industrial base, a senior U.s. Air Force official said Tuesday. “While it will have some impact on the F-35 program, I don’t think it’s going to be any type of devastating impact if … there’s a policy decision that they are no longer a partner,” Grant told reporters in a Dec. 4 roundtable interview just weeks before she puts a cap on a 16-year career with the Air Force. On Jan. 7, Grant will take over as head of the Defense Technology Security Administration, the Defense Department’s lead agency for ensuring that sales of weapon systems to foreign nations will not endanger U.S. technological advantages. As director of DTSA, Grant said she expects to play “an even more active role” on the question of whether to export the F-35 to Turkey. Some lawmakers are concerned that — should Ankara move forward with its purchase of the S-400 — Russia could build back doors into the anti-aircraft system that allows it to glean classified information about NATO capabilities like the F-35. In its most recent defense policy bill, Congress included language that prohibits Turkey from taking hold of its F-35s until the Pentagon delivered on Turkey’s role in the program and potential risks posed by a Turkish S-400. The unclassified summary of the report, obtained last week by Bloomberg, restated that Turkey may face expulsion from the F-35 program if the S-400 deal goes through. That outcome could influence the U.S. government’s relationship with other partner nations that have also signed on to buy the S-400, such as India or Qatar. Turkey is set to buy 100 Joint Strike Fighters over the course of the program, and its first F-35 pilots have already begun training alongside U.S. pilots at Luke Air Force Base, Arizona. Turkish companies play a key industrial role in the program as one of the producers of the center fuselage and the maker of the cockpit display. Grant said she was unaware how long it would take to replace Turkey’s contributions to the F-35 program or what proposed solutions the Trump administration is offering to the country. But she fears it may be too late at this point to persuade the Turkish government to abandon the S-400 deal. “It is what it is at this point. If they’ve made up their mind already, they’re a sovereign nation — to buy another country’s system, we’re going to have to work through those policy issues,” she said. “But what I’d like to do when I get over there [to DTSA] is [figure out] how do we avoid even getting to that point and make sure that U.S. is the partner of choice. Turkish officials have remained adamant that the country will buy the S-400. In October, Turkish Defence Minister Hulusi Akar expressed disappointment with U.S. and European air defense system offerings and said that Turkey may receive the S-400 as early as fall 2019. Despite political friction between the United States and Turkey, the relationship between the countries’ militaries continues to be solid, Grant said. Danish and Dutch crews start their training shortly at Luke AFB as part of a new USAF squadron, the same as has been done with other partner and FMS sale initial training. The 308th Fighter Squadron was stood up in a ceremony at Luke Air Force Base on Nov. 30th as part of a F-35 training unit for the Netherlands and Denmark. Squadron operations will begin this month, according to the Air Force. Luke is the primary training center for F-35 operators with the 308th being the fourth squadron to come online at the base. "The 308th FS is the fourth F-35 squadron at Luke, but the most important part of this activation is that we will be with two partner nations," Lt. Col. Robert Miller, commander of the 308th FS, said in a press release. "In a few weeks, the Dutch will start their F-35 training followed by the Danes." Denmark plans to acquire 27 of the F-35A conventional take-off stealth planes, with active service beginning in 2022. The Netherlands plans to purchase 37 of the planes, but is open to more to replace their F-16 fleet. Denmark and the Netherlands are both partners in the Joint Strike Fighter program.The F-35A is the standard land-based model of the aircraft and has greater maneuverability then the B and C variants. The initial training program at Luke will last over two years, the Air Force said. The F-35 Lightning II Joint Strike Fighter is a fifth generation multi-role stealth fighter, which will replace much of the U.S. Air Force, Navy and Marine Corps current air superiority and attack planes. It will also be exported to approved allies across the world, with many participants already having received its first purchases of the fighter for testing. The F-35 is expected to enter full service over the next several years with the U.S. and allied nations, with some squadrons already partly operational and forward deployed. This probably has been reviewed before, but I'll and my 2 cents. It is $5.95 on Amazon Kindle version. Lots of information, lots of pictures and diagrams. Probably a little out of date by now. Writer is obviously a fan, maybe a little to much so. Kindle Version: a little awkwardly transitioned from book version. Lots of fs turn into other characters. The chapter on the 737 F-35 trainer/tester is utterly unreadable with missing words, lines, and maybe paragraphs. But if you want to read a short book on this well worth the $5. Some parts of this article is valid criticism of the RAAF and Aus DoD but I can also understand their position, which is similar to what the British went through recently as well, regarding waiting for contracts and long term support agreements to be signed before they commit to an annual maintenance cost for the aircraft. Days before the first two of Australia's F-35 Joint Strike Fighters are due to land in Williamtown, NSW, the national auditor has found the price tag for keeping them in the air won't be known before 2020. The federal audit office, in a report tabled in parliament on Wednesday, said the government decided to purchase the planes using rough estimates of the cost to maintain them, ignoring Defence Department guidelines for approving major spending, and against the findings of previous reviews and audits. A review board convened by Defence in October 2018 raised problems with the maintenance program intended to support the F-35s, saying it was "immature" and faced a number of challenges. As it relied on a US-centred, multi-nation maintenance program, the Defence Department was constrained in managing risks, including access to spare parts, the audit report said. F-35s will perform air combat, bombing and surveillance for Australia's military, and of more than 3000 aircraft to be built for nine participating partner nations, the US will keep about 75 per cent. Defence has described the build as one of the most technologically advanced and complex ever undertaken in defence aviation. Seems as good a place as any to host the HSPI organisation. The ANAO report from which the news article above was derived. Another image of the F-35B landing on the QE. Amazing how high in the water the QE is. Some info on how AI is going to hopefully influence and speed up the process for the creation and maintenance of mission Data Files and will hopefully push ALIS even further than it already is. The F-35 program office announced today the aircraft had finally reached its initial operational test & evaluation phase, which is expected to wrap up next September. That’s three months behind previous projections for mid-summer — the result of the program’s first crash (fortunately non-fatal) and a subsequent grounding — and 16 months behind the original testing plan from 2012. The announcement means the Air Force, Navy, and Marines will begin testing all three F-35 variants under realistic combat conditions to determine their suitability for combat, followed by a decision to begin full rate production at the end of 2019. The Pentagon did allow the program office to start some of the testing early, including cold-weather testing, weapons demonstrations, and other activities earlier this year. “Start of formal operational testing is a milestone more than 18 years in the making,” Vice Adm. Mat Winter, F-35 Program executive officer, said in a statement. There are over 340 F-35s are already operating from 15 US and allies bases around the globe as the Pentagon and Lockheed Martin continue to work on resolving a list of problem and deficiencies that continue to plague the program, many in the plane’s incredibly complex software. This fall, the UK landed its first F-35B aboard its newest aircraft carrier, HMS Queen Elizabeth, a ship built specifically to operate the F-35. The top Pentagon buyer Ellen Lord said recently the operating cost for the F-35 has to come down while mission capable rates must ramp up by double-digits. And it needs to happen next year. Some interesting work being done at Miramar to maintain energy security. Also interesting that the F-35B uses 150% of the energy of the legacy Hornet. Makes sense given the increased electrical architecture used in the jet and the trend was that the legacy Hornet used 150% of the energy required for the aircraft it replaced. The F-35 Lightning II jet will hike Marine Corps Air Station (MCAS) Miramar’s utility costs by 150 percent compared to legacy F/A-18 Hornets, an expense driven by greater power requirements to maintain and operate the highly complex, fifth-generation aircraft, a senior official told a group of energy officials. But an expanding micro-grid and alternative energy projects could take a bite out of that bigger bill when the F-35 comes online by 2020, Col. Charles B. Dockery, the MCAS Miramar commander, said at a briefing Dec 3. “We know already our F-35 hangars are burning about 150 percent more energy than the standard Hornet or Harrier hangar that I grew up in, so that’s a concern,” he told California Public Utilities Commission and California Energy Commission members who joined state, city and energy firm representatives for a two-day conference at the San Diego base. Existing, older hangars can’t fully support the modern, multimission joint strike fighter, which requires hangars with upgraded electrical support. The Marine Corps is in the process of retrofitting, building or planning for hangars to support the F-35 at its fixed-wing air stations, including Yuma MCAS, Arizona, and Beaufort MCAS, South Carolina, that house the first F-35 operational and fleet replacement squadrons. The F-35’s advanced electronics, navigation, avionics, communications and weapons systems are designed to be a leap in technology and combat power, but the jet is a power hog of sorts when grounded. Compared to legacy aircraft, it draws on more power for maintenance checks, repairs and operations when on the apron or inside hangars, so these must have the proper electrical connections, data networks, communications links, and heating, ventilation and air conditioning systems in aircraft bays. “There’s infrastructure that is required to do some specific maintenance on the lift fan of the aircraft or [that] it requires conditioned air as part of that process,” Dockery said, in response to a question about the F-35’s increased power support requirement. “This is a story that’s going on across the Navy as we try and rise to this new global power competition,” said John A. Kliem, a retired captain and civil engineer and executive director of the Navy’s Resilient Energy Program Office. Miramar’s first F-35 hangar is currently under construction and is slated for completion in late 2019. It’s one of nine construction projects planned at the air station to support the F-35. The Marine Corps is buying the single-seat F-35 Lightning II — the F-35B with short-takeoff-and-landing capability and the F-35C for land and shipboard operations — to replace its fleet of Hornets, AV-8B Harriers and EA-6B Prowler jets. So far, the Marine Corps has two F-35 squadrons based at Yuma MCAS and another squadron at Iwakuni MCAS, Japan. The first F-35C and F-35B jets are scheduled to arrive at Miramar starting in 2020, with Marine Fighter Attack Squadron 314 transitioning from the F/A-18 Hornet to the F-35C and VMFA-225 from its twin-seat F/A-18D Hornets to the F-35B, according to the 2018 Marine Aviation Plan. Dockery, a veteran F/A-18 naval flight officer, said energy costs for 2020 “is always in the back of my mind.” It’s among several energy-related and budgetary challenges the air station faces as it looks to stay capable, relevant and modernized to support operational forces. Two-thirds of the Marine Corps and Navy’s air-to-air and air-to-ground and live-fire training ranges are located within one flight’s distance from Miramar, located in northern San Diego. That location makes Miramar critical to support military training and project joint forces across the Indo-Pacific region. “We help 3rd MAW [Marine Aircraft Wing] project their aircraft ... so they can maintain their ready and lethal force to deploy,” he said. To add to that worry, expected cuts coming in the next Department of Defense’s budget, as well as shrinking Navy capital funding, could lead to more belt-tightening moves in the fiscal 2020 budget. That outlook may worsen in the face of likely higher energy costs, a trend of climbing rates that affect all military installations. This is compounded by aging installation infrastructure. But Miramar officials hope that the Navy and Marine Corps’ investments in renewable, “green” energy innovations, along with more efficient fossil-fuel systems, will offset rising costs, including tapping into landfill gases for electricity and beefing up its micro-grid. “We have some opportunities out there ... that’s not only going to keep my costs down but is also going to make me energy resilient,” Dockery said. A $20 million investment by the Defense Department is helping help shore up that resiliency, officials say. In recent years, Miramar demonstrated a micro-grid to help find ways for installations to become more energy efficient and build energy resiliency to reduce costs and enable continued operations when the power grid goes down. “If everything goes dark, I need something I can turn on right now,” Dockery said. Miramar already buys 3.2 megawatts of electricity — one megawatt is enough to power 750 to 1,000 homes — from San Diego Gas & Electric, the local utility provider. A backup power plant will provide to up 7 megawatts of power from four diesel and natural-gas generators to power the air station’s flightline and more than 100 buildings nearby. “So when SDG&E goes dark, I’m still launching and recovering airplanes,” said Dockery. This year, Miramar received a $5 million California Energy Commission grant to store up to 3 megawatts of energy in the installation micro-grid with backup batteries. By next year, Miramar will draw from a mix of energy sources, including electricity and natural gas from the regional power grid; electricity generated by solar and methane gas from the adjacent San Diego landfill and integrated into the air station’s micro-grid; and a building-level, $3 million micro-grid project with a large solar array and batteries to power the station’s Energy & Water Operations Center building off-grid, or in “island mode.” The Marine Corps also is boosting its collection and use of reclaimed water, which reduces the amount of pricier potable water that Miramar purchases, and a water project agreement with the city of San Diego is expected to improve water quality and water resiliency at Miramar, officials said. “Resilience is a solution that involves all of it,” Mick Wasco, Miramar’s energy program manager, said in a briefing to the group. “We had the renewables, but we had to bring in conventional power to make it all work,” he added. The addition of battery storage also will help provide “power quality” and consistent demand, filling in as needed with fluctuations in available renewable-power generation, he noted. Lt. Col. Brandon Newell, who heads innovation projects for Marine Corps Installations-West, said the goal is to shore up critical infrastructure when most needed. “Our vision — our aspiration — for resiliency for installations is that we can go 14 days, no matter what happens external to the base, (and) that energy, water, communications, food and logistics can support the mission that’s required of that base,” Newell said. The Marine Corps also is boosting its collection and use of reclaimed water, which reduces the amount of pricier potable water that Miramar purchases, and a water project agreement with the city of San Diego is expected to improve water quality and water resiliency at Miramar, officials said. Interesting move to consolidate the F-22 at other bases and replace it at Tyndall with the F-35. Also seems the right time given how much of the infrastructure at Tyndall needs to be repaired they may as well upgrade it in preparation for the arrival of the F-35. Following the damage to Tyndall Air Force Base, Florida, caused by Hurricane Michael, the Air Force is recommending that Congress use supplemental funding for rebuilding the base to prepare to receive the F-35 Lightning II fighter at the north Florida installation. The single-engine jet was given a coating which makes it 'invisible' to enemy radar, but it is wearing off quicker than expected with RAF chiefs saying they have to replace it after every flight. The Maryland-based company have acknowledged the defects in the coating, called LO or Low Observable, that makes it hard for enemy radars to pick up the jets. They also made it clear that the coating does have to be replaced but not at the frequency that the RAF are dealing with. Speaking to reporters at Lockheed's media day on Monday, Jeff Babione acknowledged that they were having a problem with the material. 'It's not a human problem; that's just the result of our ability. We're approaching the limits of our ability to build some of these things from precise-enough technology,' Babione said in reaction to unprecedented orders for the jet. Babione did admit that human error can sometimes hamper the jets, which are in a way very delicate, with even just a small scratch possibly proving deadly. 'On the other hand, we inadvertently scratch the coating system, and we have to repaint it. Or when the mechanics spray the airplane [with LO coating], not all of it is robotically sprayed. There's some overspray, and they have to go clean that,' he said. The source also told the paper that defence secretary Gavin Williamson and RAF Air Chief Marshal Sir Stephen have always known about the issue. A company spokesman for Lockheed Martin told The Express that the coating is proving to be a significant success because of its practical strong points of speed and low cost. Fascinating, proof once again that RF physics is very unforgiving. The first Lockheed Martin F-35As to be permanently based in Australia have arrived at the Royal Australian Air Force's Williamtown base in New South Wales. Bearing the registrations A35-009 and A35-010, the pair reached their new home after a ferry flight across the Pacific from Luke AFB in Arizona, says defence minister Christopher Pyne. The pair are part of an overall acquisition of 72 F-35As for Australia, valued at A$17 billion ($12 billion), and have been assigned to the air force's 3 Sqn. Ultimately, F-35As will operate from the service's bases at Williamtown and Tindal, Northern Territory. The RAAF aims to achieve initial operating capability with the type in December 2020. This milestone will include the availability of weapons such as the Raytheon AIM-120 AMRAAM and AIM-9X Sidewinder air-to-air missiles, Boeing JDAMs and small diameter bombs, and the fighter's internal 25mm cannon. Flight Fleets Analyzer shows that Australia has taken delivery of 10 F-35As. Most of these are now serving with an international training school at Luke AFB. This is not the first time the F-35A has been in Australia. The type also visited Airshow Australia at Avalon, Queensland in early 2017. But the sky is not falling in just yet. There are means to fix the issues and I have quoted multiple articles that talk about the method and tools available to fix the LO coating on jets deployed in the field. Clearly LM needs to lift their game when it comes to paint application but take the Daily Mail sensationalism out of the article and all is not as bad as they would have you believe. Multiple JPO staff and LM execs have highlighted that the reductions in LO maintenance on the F-35 is one of the great successes of the program and clearly the reduced LO sustainment costs compared to the F-22 and other LO designs demonstrate this. I expect that once this is overcome the sustainemnt costs will likely drop below F-16 levels as the rest of the jet has been tuned very well to lower those costs and the LO stuff is what is initially keeping it higher. I do agree though, to get the orders of magnitude reductions that the F-35 achieves takes some precise application and attention. I actually met a flat Earther in Dresden a few months ago. He also insisted I was Jeff Bridges and bought me drinks, so I pretended to listen. It's good to know that an Air Commadore and former director of defence studies is a complete idiot. Air Commodore Andrew Lambert attended Wellington College and the Royal Air Force College, Cranwell. After flying training as a navigator, he was posted to Phantoms and served on Nos 54, 31 and 23 Squadrons, in Ground-Attack, Strike and Air Defense roles. In 1978 he was awarded the Nicolson Trophy as the best Qualified Weapons Instructor student, and in 1979 he was co-author of a paper on “Mixed Fighter Forces” which won the Wilkinson Battle of Britain Memorial Sword. As a Squadron Leader in 1981, he served on No 23 Squadron as the Weapons Leader, and then as Flight Commander in the Falkland Islands. On return to the UK he commanded the Phantom Weapons Instructor School, and was awarded the Queen’s Commendation for Valuable Service in the Air. He attended the RAF Staff College in 1986. As a Wing Commander he served in the Plans Branch at HQ Strike Command where he participated in the UK battle study for Operation Granby (Operation Desert Shield/Storm). After conversion to the F3 Tornado, in June 1991, he returned again to No 23 Squadron, this time as Squadron Commander. After commanding the squadron on operations over Bosnia (Operation Deny Flight), he undertook an M Phil course in International Relations at Cambridge University. From 1994 -1997 he was the Director of Defense Studies for the RAF. In August 1997 he was appointed Air Commander and Chief of Staff, British Forces Falkland Islands. After a further period at Downing College, researching Coercion, he served as Commander British Forces Warden during the SAM and AAA attacks by Iraqi forces from February to August 1999. After a short period in the MOD he was Deputy Commander NATO Air Operations, Norway, from March 2000 to September 2001, before returning to the UK as Assistant Commandant (Air) and Director of Training and Education at the Joint Services Command and Staff College. He retired from the RAF on 12 October 2003 and now lectures widely on History and Air Power matters. He is the RAF’s Spokesman on the United Kingdom National Defense Association, and is a member of the UKNDA Board of Directors. He is a late Fellow Commoner of Downing College, Cambridge, a Member of the Royal Institute of Navigation, and a member of the Royal United Services Institute. He has published a number of monographs, particularly on the Psychological Impact of Air Power and on Coercion. Air Cdre Lambert holds the position of Honorary Chairman as wel as a permanent member of the Board of Directors of ERPIC. An article from the head of the JPO on the F-35 and expectations for the year ahead. As the “quarterback for the joint force,” the F-35 provides new transformational capabilities that will fundamentally change the way our nation’s military operates around the globe. More than a fighter jet, the F-35’s ability to collect, analyze and share data is a powerful force multiplier that enhances all airborne, sea and ground-based assets in the battlespace, while ensuring our war fighters can execute their mission and return home safe. With stealth technology, advanced sensors, weapons capacity and range, the F-35 is the most lethal, survivable, connected and interoperable fighter aircraft ever built. The F-35 program plays a central role in our National Defense Strategy, which calls for building a more lethal joint force, strengthening global alliances and reforming business practices to enhance affordability. The F-35 weapons system is a multimission, next-generation strike fighter that provides our war fighters unmatched, game-changing technology in the domains of sensor fusion, stealth and interoperability. The unique F-35 partnership brings together three U.S. services (the U.S. Air Force, the U.S. Marine Corps and the U.S. Navy) with our eight partner nations (the United Kingdom, Italy, the Netherlands, Turkey, Canada, Australia, Denmark and Norway), and four Foreign Military Sales customers (Israel, Japan, the Republic of Korea and Belgium) — each of whom are integral to the planning and execution of the complete F-35 program. The F-35’s projected service life extends out for more than 50 years (2070), and to ensure the aircraft remains combat-ready and ahead of adversaries, the enterprise will continually deliver enhanced capability to the war fighter with a focus on affordability and speed. The F-35 Joint Program Office’s strategic focus remains on accountable affordability and timely delivery of required capabilities. To that end, the JPO is leading a continued transformation of the F-35 enterprise from a developmental and initial production environment to a full-rate production and continuous modernization environment, while sustaining the substantial growing global operations. In 2018, the F-35 program completed the most comprehensive, rigorous and safest developmental flight test program in aviation history. More than 9,200 sorties, 17,000 flight hours and 65,000 test points were achieved to verify the design, durability, software, sensors, weapons capability and performance for all three F-35 variants. In 2019, F-35 flight testing continues in support of phased capability improvements and modernization of the F-35 air system. This agile framework, known as “continuous capability development and delivery,” provides timely, affordable, incremental war-fighting capability improvements to maintain air dominance against evolving threats to the United States and our allies. More than 340 F-35s are currently in the global fleet, and by the end of 2019 there will be almost 500 air systems delivered. Production ramp-up will continue as operational testing concludes in the summer of 2019 and the program enters a full-rate production decision in the fall. To prepare for this major production ramp, production experts from across the United States government are working with our industry partners to lean out production process flow, increase production quality, and deliver parts on time and at reduced cost. To achieve these efficiencies, the program has incorporated a number of performance initiatives and incentives across the entire supply chain to support F-35 production lines in Italy, Japan and the United States. Driving down cost is critical to the success of this program, and for the 11th consecutive year, the cost of an F-35A was lowered. The Lot 11 F-35A unit price, including aircraft, engine and fee, is $89.2 million; this represents a 5.4 percent reduction from previous lot aircraft. Unit cost for the F-35B and F-35C went down to their lowest costs to date. As production ramps up, we are working with industry to drive further cost reductions. We are on track to reduce the cost of the F-35A to less than $80 million by 2020 — which is equal to or less than legacy aircraft, while providing a major leap in war-fighting capability. F-35 global alliances and capabilities continue to grow. By the end of 2018, the United Kingdom and Italy will declare initial operational capability with their F-35B and F-35A aircraft, respectively. In 2019, the Netherlands, Turkey and Korea will receive their first aircraft arrivals in country. Additionally, the U.S. Navy, Norway, Japan and Korea are planning to declare initial operational capability in 2019. These major milestones require measured levels of sustainment, availability and operational readiness for the F-35 fleet. We are in the midst of a major growing phase in the program, as our three U.S. services, six of our eight current partners and three of our four FMS teammates will be operating aircraft in country by 2021. To support the F-35 global fleet and the secretary of defense’s directive to attain an 80 percent mission-capability rate by the end of 2019, government, international allies and industry representatives are increasing spare part supplies, accelerating depot activations, and implementing reliability and maintainability improvement plans to ensure maintainers get the parts they need, when they need them, to sustain F-35s more efficiently. To speed up repairs and lower costs, we are leveraging government capabilities at fleet readiness and air logistics centers, and we are empowering flight line workers with greater authority to streamline standard maintenance actions. These combined sustainment and logistic actions and initiatives will improve overall F-35 readiness for the war fighter. The year 2018 has been a very good one, with 2019 poised to surpass those accomplishments. However, the challenges to affordability and timely capability delivery remain. The threats and adversaries we face today are more complex and advanced than ever before. The F-35’s success is of vital importance to our national security. The F-35 forms the backbone of U.S. air combat superiority for decades to come. It enhances our international alliances and is a linchpin for future coalition operations. It is a big, complex, rapidly growing and accelerating program that is moving in the right direction. Our steadfast focus is on the continued advancement, development, delivery and sustainment of an affordable, global F-35 weapons system that supports the peace and, if called upon to do so, swiftly and decisively wins the fight every time. Vice Adm. Mat Winter is the program executive officer for the U.S.-led F-35 Joint Program Office. I'd suggest this move is part of the USN declaring IOC with the F-35C next year as per the current schedule and this re-aligns some units and concentrates USN F-35C operations going forward. The Navy’s F-35C squadron at Eglin Air Force Base is being deactivated, as its personnel and aircraft are slated to be combined with a second squadron at a Naval Air Station in California. The move is being made at the request of the commanders of the U.S. Pacific Fleet and the Naval Air Force, according to a Navy announcement. The squadron, VFA-101, better known as the “Grim Reapers,” has been at Eglin since 2011, where it has trained pilots and maintenance personnel for the F-35C. The F-35C is the “carrier variant” of the F-35 Lightning II stealth fighter jet, designed specifically for operating from aircraft carriers. The transition of the Grim Reapers from Eglin to Naval Air Station Lemoore, about 35 miles south of Fresno in California’s Central Valley, is scheduled to be completed by July 1 of next year, according to an announcement from the Pentagon office of the Chief of Naval Operations. The move is designed to consolidate the Navy’s F-35C pilot and maintenance training operations, according to the announcement. According to a Dec. 8 story on the Navy Times website, the consolidation of VFA-101 and the VFA-125 “Rough Raiders” is coming as the Navy works to establish its first operational F-35C squadron. Current plans call for that squadron’s initial deployment to come in 2021, aboard the aircraft carrier USS Carl Vinson. He does not be a complete idiot to not understand LO coatings or even LO period. There are probably less than 100 or few hundred people that do. For most problem sets, 4 th derivative metrics are trivial issues but for not for LO. He could be otherwise very capable and know very little about LO. It is that much a paradigm shift. Japan looking to establish their first squadron shortly and especially topical in light of the recent reports of intent to increase their order. Japan has graduated its first locally trained class of five F-35 pilots and is on track to make its first unit operational, according to a senior official with Japan’s F-35 program. Joel Malone told Defense News at the Japan International Aerospace Exhibition in Tokyo that the Japan Air Self-Defense Force is continuing to train more pilots, maintainers and other support personnel on the Lockheed Martin F-35A Lightning II Joint Strike Fighter. F-35 jets with the JASDF are assigned to the Rinji F-35 Hkoutai, a temporary JASDF unit. Following the training of five more pilots and the delivery of more F-35s, the aircraft will be transferred to the JASDF’s 302 Hikoutai, which will retire its McDonnell Douglas/Mistubishi F-4EJ Kai Phantom IIs and move from Hyakuri, north of Tokyo, to Misawa in March 2019. 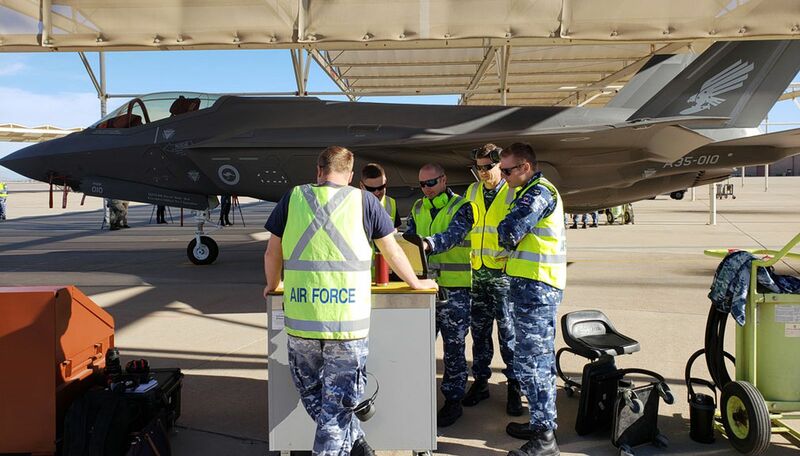 Japan initially trained a cadre of F-35 pilots and personnel with the 944th Operations Group and four of the JASDF’s aircraft at Luke Air Force Base, Arizona. The Japanese F-35s spent 18 months training at Luke AFB before returning earlier this year to Misawa, located at the northern part of Japan’s main island of Honshu. The media reports, quoting unnamed Japanese defense officials, said these included the F-35B short-takeoff-and-vertical-landing variant similar to those operated by the U.S. Marines in Japan. Japan previously studied the possibility of converting its Izumo-class helicopter destroyers to enable it to operate the F-35B, with a report released by its Defense Ministry in April 2018 concluding that was possible. However, there has been no formal announcement about intentions or plans to do so. We're not talking about a Masters degree in LO coatings here. We're talking about spending 30 minutes researching a subject before making claims and pronouncements meant to affect national defense policy. "Complete idiot" is being polite. Spouting nonsense like this from a serious position of authority should be criminal. Thanks for posting, I find it really interesting that Japan have used the term “Aircraft Carrier” after resisting that name for so long with other designs including the Izumo. Agree, he clearly has enough education to make an informed comment but chose not to. Info on one of the tests being conducted for IOT&E. “The sorties consisted of seven F-35s performing both offensive counter air, suppression of enemy air defenses and air attack operations. This marks an important milestone for the F-35 program,” said Lt. Col. Nicholas Ihde, 31st TES commander. During the IOT&E phase, the 31st TES F-35 pilots will fly more than 30 missions designed to fully evaluate the complete air system as well as identify technical and operational areas for improvement. “These unique flights place the aircraft in realistic combat conditions with our joint and coalition partners to determine the operational effectiveness and suitability for the warfighter,” Ihde said. The 31st TES has 10 F-35 pilots, 145 maintainer’s and 11 engineers to bring the F-35 program through this phase. If they discover an issue they will work with the director of operational test and evaluation, Lockheed Martin and the F-35 Joint Program Office to address it before going out to the fleet. The completion of F-35 IOT&E will aid the Navy in an initial operating capability decision and will help inform full rate production for the DoD in the future. Very interesting on how much weight is saved from going with an internal system albeit with some good design work required to handle heat. Leonardo solved an overheating issue with its miniaturised P5 Combat Training System (CTS) internal subsystem on the Lockheed Martin F-35 Lightning II Joint Strike Fighter (JSF) by installing a radiator with the liquid coolant down the middle. Chris Lettiere, Leonardo's vice-president for engineering, told Jane's on 11 December that the repacking of the pod into an internal form factor for the F-35 was a challenging redesign and repacking effort. The baseline externally carried podded system is about 63.5 kg and 76.2 m 3 , while the F-35 variant is an internally mounted unit one-quarter the size and weight of the podded system. Makes sense not only from the supplier risk perspective but also to push LM for further cost reduction. Certainly relevant for when full rate production is approved. The Pentagon is seeking a better understanding of the risks presented by key components and organisations in the Lockheed Martin F-35 Lightning II Joint Strike Fighter (JSF) sustainment supply chain that could have an impact on overall programme cost, schedule, and performance. The F-35 Joint Program Office (JPO) relies heavily on Lockheed Martin and F135 engine developer Pratt & Whitney to provide insight into sustainment supply chain risks for the air system. For those not familiar with Australian squadrons the below image has 77SQN, 75SQN and 2OCU with Hornets while 3SQN is the first to convert to the F-35. A more secure parking area now compared to the previous setup. USN continues to work through the steps required for declaring IOC early next year. The Navy’s first F-35C operational squadron completed its carrier qualifications and was deemed “safe for flight” – the final step in the squadron’s transition from the F/A-18E Super Hornet to the F35C Lightning II Joint Strike Fighter, and an important step in the journey towards reaching initial operational capability. The “safe for flight” designation means a squadron has the right personnel and equipment, as well as maintenance and safety programs, in place to support itself in conducting routine flight operations. The squadron must also be in physical custody of at least 30 percent of its assigned aircraft and, in the case of new F-35 squadrons, have the Autonomic Logistics Information System (ALIS) management system installed and operating. “Since we returned from deployment last December, our team has been driving toward fully bringing this platform online for the Navy,” VFA-147 Commanding Officer Cmdr. Patrick Corrigan said in a news release. With the ability to operate independently, the squadron will now continue to train and prepare for upcoming operational tests meant to lead to a February 2019 initial operational capability declaration. “We eagerly look forward to declaring IOC and integrating the F-35C into the Carrier Strike Group. This aircraft is a key component to maintaining the U.S. Navy’s dominance anywhere in the world,” Joint Strike Fighter Wing Commander Capt. Max McCoy said in the news release. I think it's interesting how easily all of the F-35's tip surfaces generate vorticies - even during low-G maneuvers. I'm sure there's an extremely technical reason for this due to some of the most advanced 3D aero/fluid design and testing seen on a fighter, but it's really interesting to see, especially when it's flying the same profiles and maneuvers as aircraft next to it (which obviously don't exhibit the same tendency). According to de Telegraaf the Netherlands have commited to increase their JSF order of 37 planes with roughly 15 more.